Surface water flooding is a widespread and growing problem. It occurs when the volume and speed of rainwater exceeds that which is able to filter into the ground and drain through the sewage networks. The problem gets worse when the ground is dry and baked hard as it is in many parts of the UK right now. Gemma Holmes, Senior Analyst at the CCC’s Adaptation Sub-Committee, explains what can be done about it. The Department for the Environment, Food and Rural Affairs (Defra) estimates that in England 3.2 million households are located in areas at risk of surface water flooding. 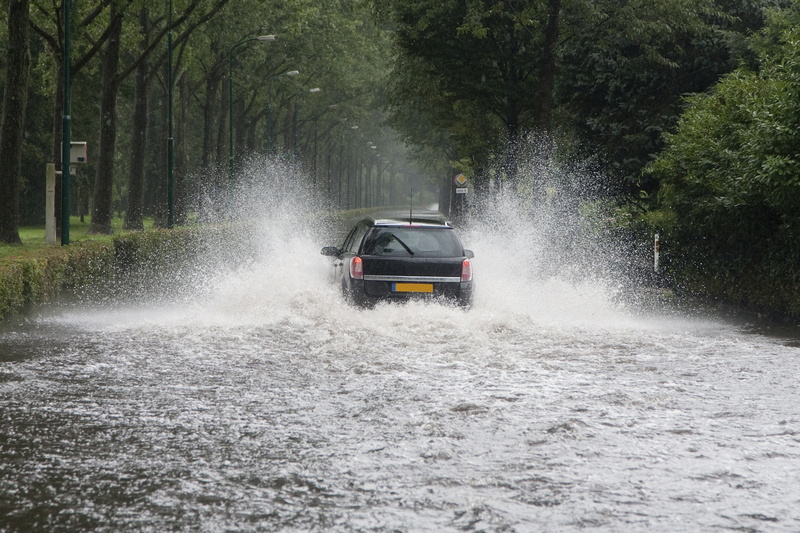 On average, damage due to surface water flooding exceeds £300 million every year. With a growing population and climate change expected to increase the intensity of heavy bursts of rainfall, the cost of associated damage could increase by about 40% by the 2050s if current management approaches continue as they are. Part of our role at the Committee on Climate Change is to understand how climate risks are being managed now and what more needs to be done as a result of the growing risk from climate change. In our 2017 Progress Report to Parliament we concluded that efforts to address surface water flooding need to increase. We reported that there was ‘little confidence that high quality sustainable drainage systems are being built in the majority of new developments’. Responsibilities for surface water tend to be fragmented between different organisations including water companies, local authorities, lead local flood authorities and the Highways Agency. What’s more, many local flood risk strategies do not show how surface water projects will be funded, or the full range of benefits they will achieve. Data is not even collated at the national level on how action already underway is changing the level of risk. Defra’s recently published Surface Water Action Plan contains a commitment to improve the knowledge of current sewer capacity, but we also want to understand how much the implementation of ‘green’ (vegetation-based) sustainable drainage systems is changing the level of risk. Surprisingly, Defra’s Action Plan doesn’t include any actions for the Ministry of Housing, Communities and Local Government (MHCLG). MHCLG’s review of planning policy concerning sustainable drainage in relation to development is still to be published, despite being promised in April 2017. To improve our own assessments in the meantime, we commissioned a project this year to look at which metrics are most important for measuring progress with regards to managing surface water flooding. We’re publishing that research today, with a hope that it will spur better monitoring efforts. We will be encouraging Defra to look at this new work as part of its wider project to develop metrics to support the implementation of the 25-Year Environment Plan, and to inform its response to this summer’s National Infrastructure Assessment. It’s important that we understand how drainage works on the ground, as well as on paper. In May I was invited to the Grade II listed Abbey Mills pumping station in London. Designed in the mid-19th Century by Sir Joseph Bazalgette, the station is part of a large network of sewers in London. The sewer system is now 150 years old and was designed to service a population of four million people. The original intention was for overflow sewage to flow into the River Thames once or twice a year, to avoid flooding streets and homes. With the population of London now at eight million, and urban areas becoming increasingly covered by impermeable surfaces such as tarmac and paving (there was a 26% increase in hard surfacing of London’s gardens between 1999 and 2007), the sewers now overflow into the Thames once a week, on average. On top of that, more rainwater is ending up in the sewers more quickly, increasing the risk of surface water flooding. The new Thames Tideway Tunnel – a major new sewer that will help tackle the problem of overflows – has been designed to cope with the demands of the city and a changing climate into the 22nd Century. Similar thinking is needed elsewhere. We will consider how new policies and actions have altered the level of preparedness for surface water flooding in our next progress report to Parliament in 2019. We will also review the level of surface water flood risk now and in the future across the UK as part of our work on the third UK Climate Change Risk Assessment (CCRA), due for publication in 2021. We are also commissioning a detailed project to update our flood projections to inform the CCRA. Flooding is one of the key risks facing the UK from climate change: the more research we can do to inform our recommendations to Government, the better.